The nearly miniature ink drawings and sculptures of Angelika Arendt invite us to become immersed in delicate ornamentation and plant-like structures that mirror the processual nature of art and life. Her works lead lives of their own, and the beholder literally feels how the ink drawings, expanding from particular areas in the compositions, begin to grow across the paper grounds. 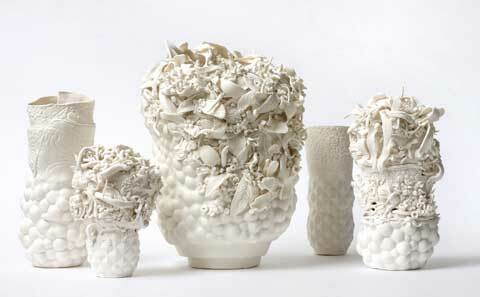 With their exuberant forms, her drawings and plastic works recall the natural processes of growth and vegetation. One encounters botanical structures, honeycombs, dripstones and coral reefs. Her vocabulary of forms encompasses a multiplicity of organic and amorphous structures that she then combines with fundamental geometric forms. Her works are characterised by an intense degree of concentration, detailed elaboration and precision. Beneath the surface of her ornamental outgrowths, however, set-pieces, so to speak, appropriated from reality—architectural elements, figures and landscapes—are, at times, concealed. Upon closer examination, they begin to peel, as it were, beneath the delicate structures to evoke associations with cultural semiotic systems. The concentration of details and patterns comprised of pearls, contours, rhombuses, stripes, blossoms and planes finally, in all its abstract lushness, morphs into a living narrative pattern that spawns the disclosure of myriad stories.